Brace yourself! 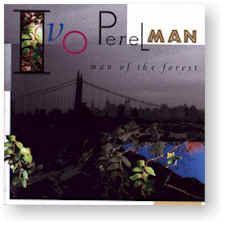 Man of the Forest is Brazilian Ivo Perelman’s breathtaking vision of the music of fellow countryman and renowned composer Heitor Villa-Lobos. Ivo reveals the same brilliant vision in his selection of personnel for this project. The rich blend of Brazilian-born percussionists Nana Vasconcelos (Pat Metheny, Jan Garbarek), Guilherme Franco, Cyro Baptista and Duduka da Fonseca, sparked by the legendary American trap-set wizard Billy Hart, provides a highly combustible rhythmic fuel. Joanne Brackeen and Mark Helias need no intro; in addition to being accomplished solo artists, both are members of New York City’s session elite. A final, spicy touch is provided by Dom Salvador’s flavorful country accordion, indigenous to the mountains and savannas of Brazil. This is music at its best — intelligent, impassioned, high-voltage, fearless, and new. All pieces based on motifs by Heitor Villa-Lobos, adapted by Ivo Perelman. Recorded Jan. 3 & 4, 1994 at Sear Sound in New York City.